The Power and number of the Gods of the Tuatha are by far too numerous to list and mention here at this time,but the few I have listed are integral to the understanding and weaving of the Might of the Tuatha and the Sidhe. The Tuatha Gods are of the Witta,not all are Horned and their functions vary to their own energy.Tuatha is usually not Wiccan,but shares certain flavors of the aspects in trying to relate them to One God aspect is rough,but can be done if one wishes to take up that path. The Father of the Tuatha,also known as the Good God.the God of the Harp that sings three strains,and the Lord of the cauldron the Undry that will never feed a coward.He is the God that carries the Club(Phallus)and the Mater of the Morrigu for the Victory of theTuatha over the Fomorians.Upon which a sacred river springs forth from their union at Samhain.He is sometimes known as being Horned.His is the Potency of the Tuatha and His is the Might of Happiness,Goodness and Plenty.He is the God of Red Wisdom,and the God of the Horse as All-Father.there is so much about Him I couldnt fit it all in this site. Lugh Lamfada,LughSamildanch,Lugh of the Long Arm,Grand Son of Balor of the Evil Eye,God of Three-Hundred Ravens,Many skilled that none can compare to His Learning and Skill.Sun God and Oftimes Horned God,Lord of the Forests and the Crops.He is the God that leads the Tuatha to Victory over the Fomorians with the Help of the Morrigu,upon which He kills his Grand Father balor with a sling(sometimes Spear)by Closing one eye and standing on one foot and hurls,He is also the God of the Telltown Games,a form of Tuatha OlympicsHe is the Wise Ruler of the Tuatha and the Sidhe and His Presence s still felt in the Battle Area of Mag Tuerdh in Ireland today.There is so much known about Him,much reading a research is a help here. The Smith of the Gods,the Forger of the weapons that lead the Tuatha to Victory.He is the God of the Mound and Hidden Fire that He Wealds and creates or destroys in the Name of the Tuatha.He is also the Oath Keeper to those Sworn to the Tuatha by Word and Deed. The God of the Fairy Brugh and the Lord of poetry and Magick of the Sidhe.His is the aspect of the God as Love and the Protector of the Sidhe.His is the Potency of the Masculine and Gentleness of the Male Principle in its most refined form.Swan God that Enchants the Mists and Magick of Tuatha with His Golden Touch and Shimmering Being. A God of the Sidhe and the Helper of the Tuatha,but it is uncertain if He Is Tuatha Himself.Lord of Glamoury and theWave.God of the Portal between theWorld of the Sidhe and Man.Thee is so much known of Him it wouldnt be possible to list it all here.His is the Realm of the Apple Branch and the Cup of Glamoury and Pishougue at His Table.His is the Crane Bag of Mystical Wonders and His Is the Mantle of Dreams and Nightmares.In the Tales His Wife Fell in Love with CuCulaine and When She wanted to Forget He Shook His Mantle Over Her and All Was Forgotten.Much Research is Needed here before one trys to work with Him and His Illusive and Faerie Nature. 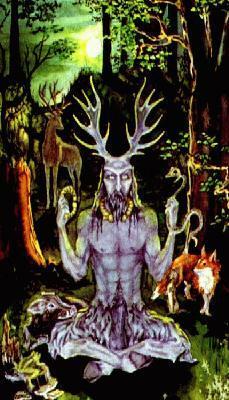 This aspect of the God who is Hunter and Horned,also brings about the Power of the Celtic peoples through the Oghams and the Wheel of Finn. (fair Haired) MacColl(son of the Hazel)The remnant Power of the Tuatha after they Changes and Became the Underworldly Sidhe.Finn is the Champion of the People(Sidhe)and the Hidden Power of the Tuatha during Periods of other Religious Occupation.Finn Himself is Both Tuatha and Not Tuatha,And His Children reflect His Hunting and Forests Connection with the Deer and Hounds,and The Terrible Boar that ends His Time.Ossian(fawn)His son marries the Naimh of the Golden Hair of the Land of Ever Young and proved His Connection to the Expressive Power of the Sidhe.His Lore is in the Fenian Cycle of the Irish and the Scots Mythos,He and His Fianna.